THE NOVEL -- HAPPINESS -- WRITTEN BY COUNTESS SOFIA ZUBOV IN 1902. The only copy of a novel is found after 100 years. The author’s husband destroyed all the others. Was it too true to life? How was it found? HAPPINESS is a Lithuanian-Polish-Russian novel set at the turn of the 20th Century in Lithuania. The visitor to an estate falls in love with the hostess. Mykolas, a pampered young noble from Warsaw, visits the country estate of his university friend Steponas for the summer, and falls for Steponas’ wife Elvyra. She’s a super mother, lady of the manor, and a Darwinist. They talk about philosophy and love. Soon he follows her around like a puppy, hoping for more. Touches her. It turns out his friend Steponas has just tried to persuade his wife to have an open marriage. 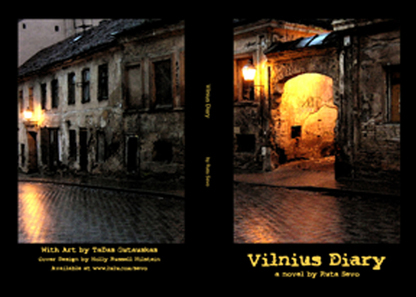 Zenius comes to Vilnius and hopes to explain his parents’ flight from their homeland. Lithuania itself is just waking to truths about the Holocaust and Gulag, suppressed during 50 years’ Soviet occupation. His parents were silent and traumatized. What happened? His personal world—in a temporary visit to a foreign city—begins to fall apart. Things happen that he cannot explain. Strange drawings. Why? A story of travel, family, and loss. Art by Tadas Gutauskas (www.gutauskai.lt) + photo illustrations. Cover design by Holly Russell. A short memoir by Jonas Fledzinskas, about his life in Lithuania during the first half of the 20th Century. He married Aleksandra Zubovaite (1891-1961), a Countess, who inherited the Ginkunai estate belonging to the Zubovs. They experienced the disruptions of history (WWI and WWII), but enjoyed a period of about 20 years of Lithuanian independence. During that time he played a role in developing agricultural exports, organizing cooperatives and unions, raising the quality of farm produce, and enabling modern farming techniques. The Ginkunai estate was taken over by German and Russian military at various times. Translated from Lithuanian by Ruta Pempe Sevo (his grand-daughter) with Vytautas Fledzinskas (his son) and Sophie Pempe (his daughter). Includes family photos, a life timeline, family trees, and short historical background. ​A young teacher navigates the politics of a territory continually “annexed:” Memel/Klaipeda. A raw, short account of what happened to a serious teacher of physical education when the Germans took over Memel and parts of Lithuania in 1939. He struggles with his multicultural identity in face of life-threatening politics, and continually weighs his convictions in choosing citizenship and jobs. The story is a fictionalized memoir written in the third person. The author is really ERIC PEMPE, my father.